Used successfully by thousands of business managers, educators, and government leaders around the world, Six Thinking Hats offers a practical and uniquely positive approach to making decisions and exploring new ideas. Through case studies and real-life examples, Dr. de Bono reveals the often surprising ways in which deliberate role playing can make you a better thinker. He offers a powerfully simple tool that you--and your business, whether it's a start-up or a major corporation--can use to create a climate of clearer thinking, improved communication, and greater creativity. His book is an instructive and inspiring text for anyone who makes decisions, in business or in life. Ships from and sold by Bahamut Media. This is a 25 years old book that I only just heard of. As a business book, its ideas are hard to implement so they have gone nowhere. But turns out, the book is a real fine, fine thinking tool. Its ideas are new, bold and compassionate in an unusual way. One can become conscious of one's own thinking. The book doesn't negate the value of judgment or analysis which lots of new-age thinking slams. It doesn't exalt analytical thinking as the only problem solving mechanism. Creativity is at once a skill, a talent and personality. It can be developed. It's also disciplined. We human beings are each capable of balancing all kinds of thinking at different times so best we stop labeling ourselves as critical or creative. We can each develop and change. The mention of Freud's emphasis on inner analysis vs Confucius' on actions (both are needed, the influence is bi-directional) is also enlightening. I will be looking into this author to learn more. I wanted to give it 3.5 stars, but I rounded it up to 4. I think it is fair enough. IMO the book does a great work describing the white, red, black and yellow hats, but came up a little short in explaining the green hat (creativity), which is one of the most important ones. Perhaps I should or must go to other books to have a better understanding of the principles and all that is involved behind creativity. Although the author kinda does give several examples througout the chapters on individual hats, they are limited to each particular hat in isolation. It would have been mostly illustrative to have one chapter dedicated to show 2 or 3 real world scenarios that point out how everything ties up together so no loose ends are left behind. If you want to find a way to make smart decisions without taking too much time, then this book is for you. 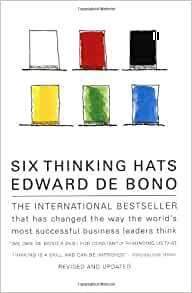 “Six Thinking Hats” is written by Edward De Bono. He makes a comparison between critical and lateral thinking. As children, we are taught to do critical thinking. We have a problem, we find a solution, and then we spend time arguing why our solution is correct. This method of thinking creates arguments and that is what De Bono tries to eliminate. He came up with the concept of the six thinking hats in order to help people think better. With the six thinking hats, people are able to solve problems without causing arguments. Each hat is represented with different colors and each one has their own meaning. The book is, in a way, divided by the different hats. At the beginning of each section, he explains what the hat represents and he gives examples of how the hat is or can be used. At the end of the “section”, De Bono gives a good summary of the hat. This makes it easy for the reader to clear up misunderstandings that they may have had in the beginning. Also, the concept of the six thinking hats is explained well. Having different colors for each hat is easy to remember what each hat represents and the concept is easy to understand. It may take some time for people to get used to using the six thinking hats but once they get used to the method, their life will become easier. People are able to come up with solutions faster using this method compared to using critical thinking. Using the Six Thinking Hats may also provide better solutions to problems because they will go over different alternatives and the best one will be the final solution to be chosen. This method of thinking allows everyone to participate and they all see each others perspectives on an issue so it is easier to decrease arguments. De Bono explains that there are two purposes for the Six Thinking Hats. The first purpose is to simplify thinking. Focusing on one part of the problem at a time becomes less overwhelming for people. The second purpose is to allow a switch in thinking. Every person has the opportunity to switch their hats so they can see the different sides of their problem. This book can help a business or a group of people improve their communication, increase their creativity, and make better decisions. Overall, this is a book worth buying. The book is easy to read and it is also very educational.